"About fifty years ago I stood in a sculptor's yard in Florence, Italy. Scattered about were unbroken, irregular pieces of granite from which a sculptor was preparing to cut out a vision which he saw in his mind. We did not pay much attention to those rude stones, for in the middle of the yard stood magnificent figure which was cared over four hundred years ago. 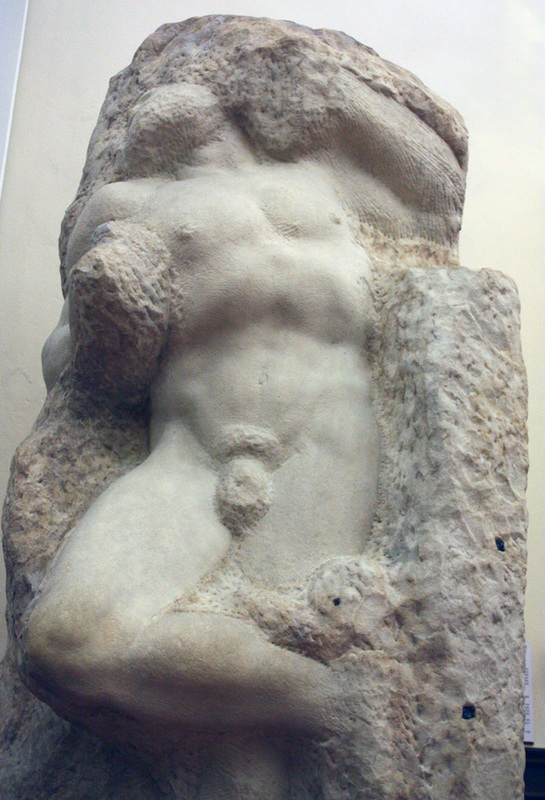 It was the famous statue entitled, 'David,' picturing David of old. It stands today in the Florence Museum, unfinished, but in our crude judgment we could not see but what it was perfectly finished. "Nevertheless, each of us is carving a soul this very minute—our own. Is it going to be a deformed one, or is it going to be something admirable and beautiful? "Yours is the responsibility. 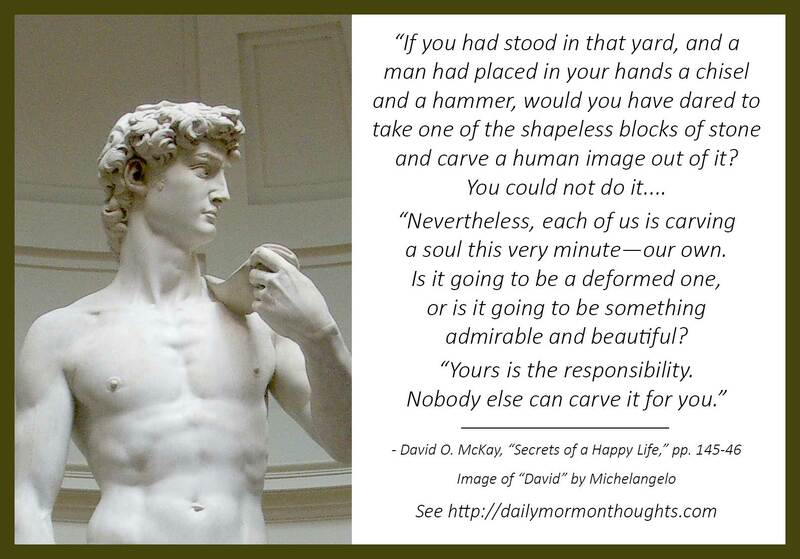 Nobody else can carve it for you.... Your tools are ideas, what you are thinking about. The thought in your mind at this moment is shaping your character, contributing, almost imperceptibly to the lineaments of your face, so that those who can read character can see what the thoughts have shaped in you, for the thoughts you have will shape your outward expression." We can forgive President McKay for making a couple of minor mistakes in his 50-year-old memory; he didn't have Wikipedia or Google search to do fact-checking. First of all, there is quite a difference between granite and marble. 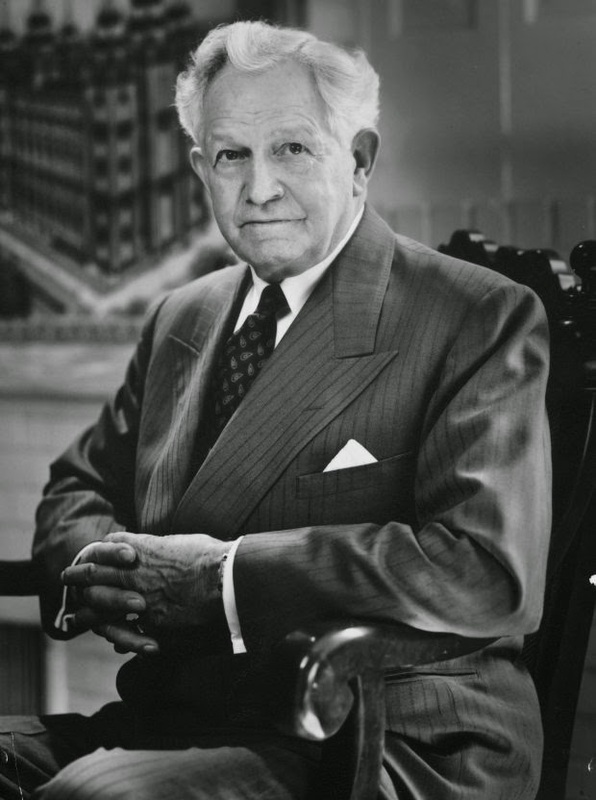 The Utah setting and the granite construction of the Salt Lake Temple were part of Pres. 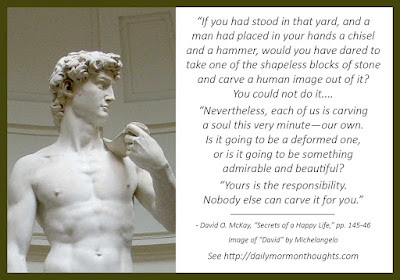 McKay's context of thinking, but the beautiful Carrara marble of Italian sculpture is a very different type of stone. And second, while the famous renaissance sculptor Michelangelo did leave a number of unfinished sculptures, his "David" was not one of them—it was certainly a complete and polished work. Some of the unfinished sculptures dramatically illustrate the imagery of a work of beauty emerging from the rock as the expert sculptor chips away from around the figure. The ability to create such fine sculpture is a spectacular and rare artistic gift. These remarkable images continue to take our breath away with their exquisite detail and expressiveness. But Pres. McKay's point is well-taken. In a symbolic way, every individual is a sculptor of his or her own soul. We are the ones who determine what that finished product will be as we shape and form our character, chipping way things that don't belong, smoothing and polishing the things that remain. It matters so very much what and how we think. The thoughts of our mind and heart, President McKay instructs, are the tools that shape our souls, and the results can be seen both inwardly and outwardly. How careful we should be! Not only do our thoughts shape our words and deeds, but they also define the faith that exists deep in our hearts and leads us to Christ. How important it is to fill our minds with good!